The Bujinkan represents almost 1000 years of living Martial Arts tradition. Training is based on 9 Ryu (schools) of ancient Japanese martial arts, encompassing a wide range of techniques and philosophies developed by the Samurai and Ninja of ancient Japan. Taught in a noncompetitive and fun environment, students learn valuable and practical self protection and survival skills. 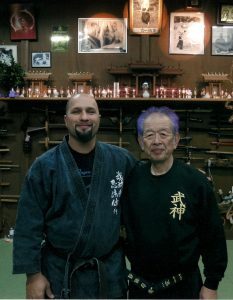 The Bujinkan Dojo is the training hall for the nine schools under the lineage of Dr. Hatsumi Masaaki of Noda, Japan. These schools are combined to make what is arguably the world's most complete form of self protection. The Mizu Nagare Dojo is committed to faithfully passing on these traditions to all students in order to provide practical, pragmatic and accessible self protection and life skills.